Today only, while supplies last, get this Bella - 17 -Quart Turkey Roaster for ONLY $24.99 (Retail $49.99)! 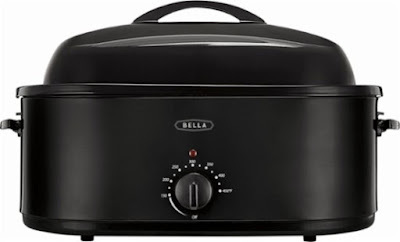 Make cooking simple with this Bella roaster oven. Five preset functions let you bake pizza or toast bagels quickly, and the large capacity can accommodate a whole turkey. This Bella roaster oven has a self-basting lid to keep poultry moist as it cooks, and the knob controls let you set the temperature quickly.